evolving as a glorified yogi and yogini with our 200 Hour Yoga TTC. Explore the metaphysics of Yoga and evolve into a sincere yoga practitioner. With Rishikul Yogshala’s 200 Hour Yoga Teacher Training Program in India and Nepal, Thailand and Vietnam, gain the projective insight and the stance to spread the art of yoga across the globe as a recognized yoga instructor and a practitioner of the finest standards. Why 200 Hour Yoga Teacher Training? In their heart, a number of yogis harbor the aspiration to learn and further preach the art of yoga as a recognized yoga teacher, while some of them aspire to gain sincere knowledge of the science in order to deepen their self-practice. But, not all of them are familiar with the veritable route to fulfill these divine aims. A 200 Hour Yoga Teacher Training Certification is specifically meant for such yogis and yoginis who wish to tread onto the path of self-discovery and inner transformation through the much enhanced teachings and practice of yoga. Those who seek the opportunity to reach out the yogic wisdom to various souls as a yoga instructor; it becomes imperative for them to undertake a sincere yoga teacher training program so it can deliver them to the desired goal. A 200 Hour YTTC is ideal for self-practicing yogis and for yoga teaching aspirants as the program lays the ground work on which you can evolve in your yogic expedition. Commence the journey of a sincere yogic experience by taking the first step towards it with the 200 Hour Yoga Training program. The main objectives of the 200 hour yoga teacher training are to develop personal growth, move throughout the day concentrating on postures, breath and contentment of the body’s constitution. These core classes will facilitate an environment to bring personal development in a calming yet challenging lifestyle that is the journey to the self. Rishikul’s 200 hour yoga training is meticulously designed to satisfy the requirements of the Ashtanga Yoga Primary Series and Hatha Yoga. The traditional language of Yoga is Sanskrit. And, we believe in teaching the majestic science of yoga with traditional authenticity and perfection. Hence, teaching the students correct usage and pronunciation of the Sanskrit names in Yoga is an essential part of our program. You will understand the root definition for each pose while undergoing breath based training. Learn the metaphysics of a human body with respect to the science of yoga during yoga anatomy classes. Imbibe the yogic lifestyle and understand the various yamas and niyamas that govern the ethics and principles of a yogic way of life, as mentioned in the Sutras of Patanjali. Study and practice the various adjustment and alignment techniques to ensure optimum performance and benefits of each asana while avoiding any asana related injury. Learn the art of yogic cooking and make yogic diet a regular part of your lifestyle to stay healthy, refined and pure throughout your life. By the end of the course, during teaching methodology classes you will have the opportunity to plan and teach your very own yoga class in front of your peers. You will gain a well-rounded knowledge of the yogic sciences and strong foundation on which to instruct your future students. 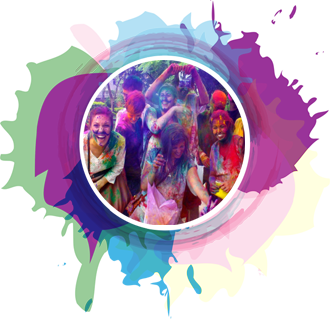 Upon completion of the course, registering with Yoga Alliance International and Yoga Alliance USA is quick and easy. Of course, discipline is the main pillar of success in becoming a true yogi. As such, we expect you to attend each class with attentiveness. But, we also understand listening to what your body tells you. Although the course is demanding, there are also two half days of free time each week with optional karma yoga trips and natural excursions. Where To Earn 200 Hour YTTC? Rishikul Yogshala acknowledges the fact that for a yoga training program to be holistically complete, it is essential to attain the science in the presence of these three elements – a sophisticated course curriculum, imparted by the finest yoga teachers and, all this in the presence of soul-stirring, yoga amicable environment that instigates the yogi and the spiritualist in you. 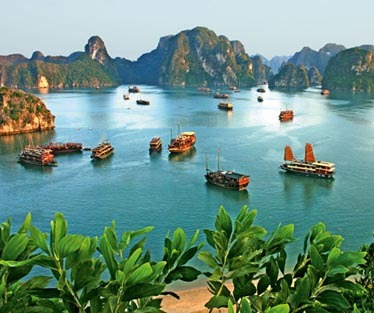 To ensure the same, we have established our program in some of the most scenic and tranquilizing locations on the globe. 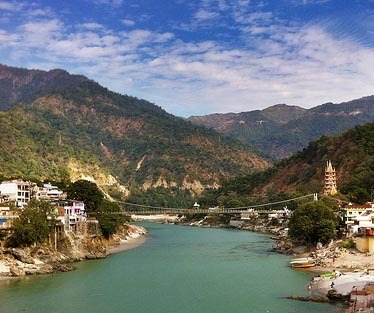 Rishikesh, the hub of yoga and spirituality in India is widely acclaimed for its yogic espionage and spiritual ambiance. The land of Holy river Ganges that is also blessed with magnanimous presence of the breathtaking Himalayas has bred several yogis and embraced millions of yoga enthusiasts and wanderers with its soulful generosity and warmth. Owing to the multifarious aspects and yogic authenticity of the town, Rishikul Yogshala has established its headquarters on its very land. 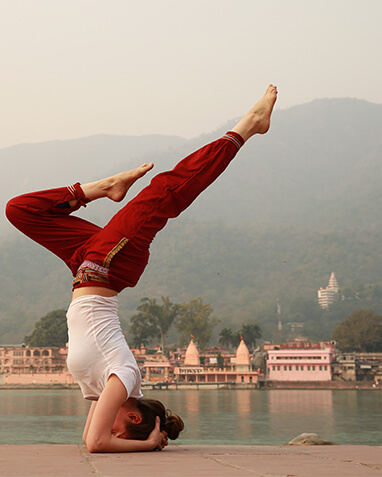 Those willing to unearth some of the deepest yogic treasures are welcome to enroll for our 200 Hour Yoga Program in Rishikesh, India. Commence the journey of yoga in the lap of snow capped Himalayan splendor and soul stirringly beautiful ambiance that exudes peace and solace in its very presence. 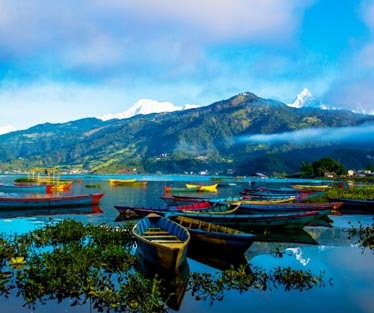 The valley of Pokhara is decked with some of the most glorious Gompas for immersing in deeper level of meditation practices while the plush green fields, reverberating river streams provide motherly comfort to a wandering soul. With our 200 Hour Yoga TTC in Nepal, indulge in the divine opportunity to absorb the teachings of yoga while dwelling in the heavenly town of Pokhara in Nepal. 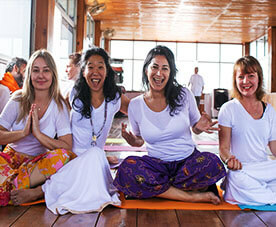 Explore the majestic art of yoga in the country of Thailand with Rishikul Yogshala. 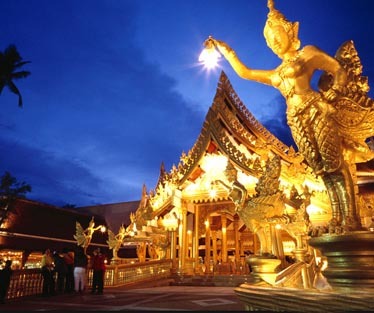 As tropical paradise, Thailand symbolizes the ancient patronage of Lord Buddha. With its enriching culture and soul capturing hydra-beauty, the town offers palatial resources for undergoing an ideal yoga and meditation program. With Rishikul Yogshala’s 200 Hour Yoga TTC in Thailand, you get to enliven a mesmeric experience that is blissfully transformative as well. 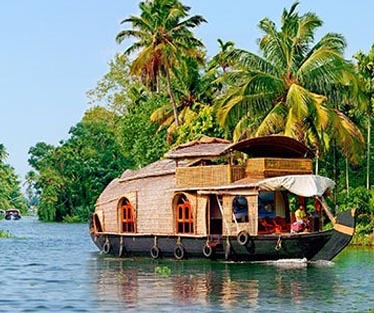 The birth land of traditional healing science of Ayurveda, the land of Kerala is indeed one of Mother Nature’s most bountiful gifts to the mankind. From breathtaking natural beauty, cleanest beaches, abundant and highly exotic flora and fauna to being the nurturer of Vedic experts, Yoga Gurus, Yoga Scholars and Erudite and Ayurveda teachers, the town is endowed with the pristine glory of Yoga and Ayurveda. 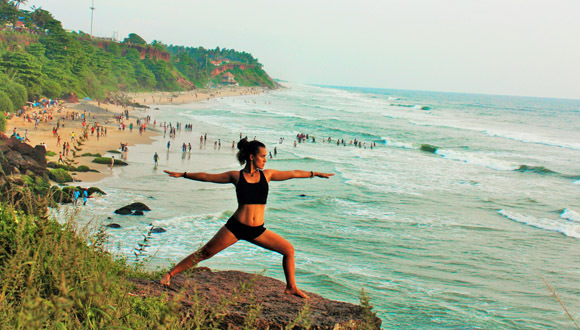 Undergo a breathtakingly divine and enlightening experience at our Yoga and Ayurveda centre on the emerald beaches of Varkala in Kerala. 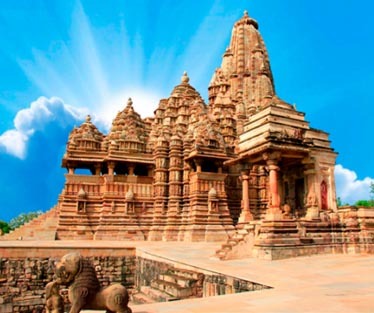 Step onto the land eminent as the globe’s finest temple art and architecture sites in Khajuraho, India. Registered as one of UNESCO World Heritage sites, the town of Khajuraho offers a fine glimpse into the traditional Heritage and polished craftsmanship of India. The place is approached and inhabited by several yogis seeking learning and practice in various yoga styles particularly Tantra Yoga. During our 200 Hour Yoga TTC in Khajuraho, India, you would get the opportunity to indulge in the ancient tradition and practices of Tantra Yoga, in addition with Hatha and Ashtanga Yoga. Immerse in a divine yogic experience in the village of Hoi An. 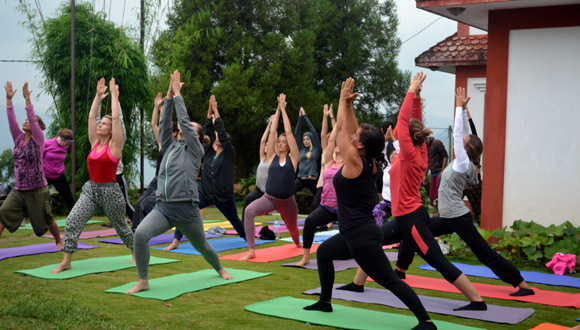 Famous as the ‘peaceful meeting place’ for people of versatile origin and culture, the village offers the idealistic escape and ambiance for a rigorous yoga training program. With our 200 Hour Yoga TTC in Hoi An, Vietnam, run in association with Nomad Yoga, you can immerse in deep yoga and meditation practices amidst a panorama of natural scenic beauty and giant pagodas spelling traditional heritage of the truly reformative art forms. Why Enroll Into 200 Hour Yoga Teacher Training Program With Us? The 200 hour yoga teacher training provided by Rishikul Yogshala is meant to build a strong and lasting foundation for a deeper self practice and, start you on the path to becoming a yoga teacher. The course is packed with information, but scheduled and delivered in a way that keeps you interested and wanting to practice more! 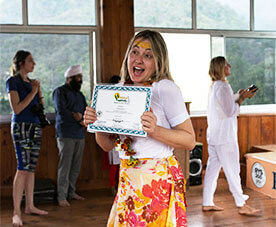 We are certified with Yoga Alliance USA and Yoga Alliance International. Upon successful completion of 200 Hour Yoga TTC with us, you are eligible for gaining the status of 200 RYT (under Yoga Alliance). 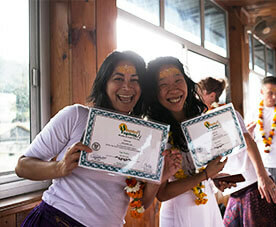 With YTTC from Rishikul, you can teach anywhere around the globe. Learn the practical and theoretical aspects of the yoga program from highly respected and experienced yoga teachers. 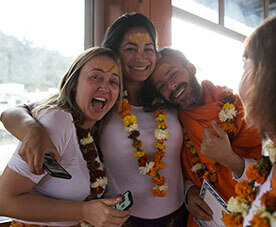 Each of the instructors and teachers at Rishikul are walking examples of the peaceful, powerful life of a yogi. 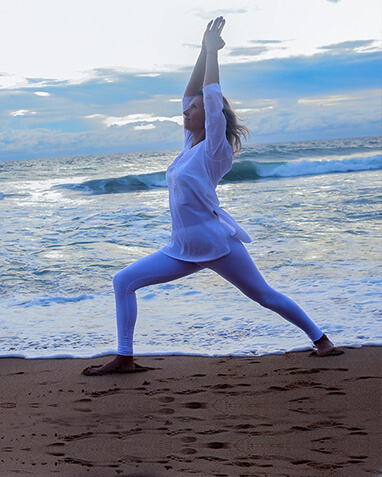 They deliver an authentic eastern and traditional yoga experience emphasizing both the mental and physical benefits of a regular yoga practice. You are a student and the teachers take that very seriously and will be available to answer any questions and offer their teachings that you might find useful. No two yoga teacher trainings are identical, just like no two students are identical. 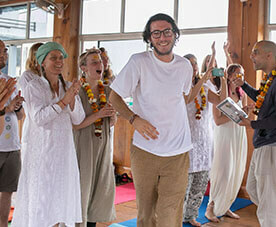 Upon completion, you will be welcomed back to Rishikul to study for the rest of your life. 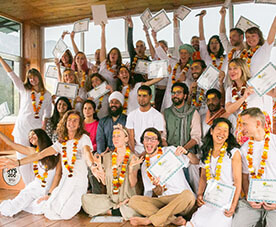 Over the course of a month, you will bond closely with your fellow students and teachers creating a worldwide yoga family that you can continually reach out to for support and success in your yoga journey. 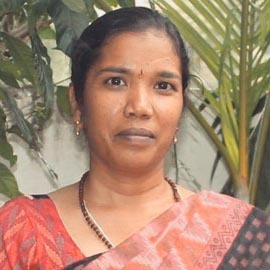 Every individual has a different approach towards the course as well as expectations as far as outcomes are concerned. A budding yoga teacher to a beginner yogi, everyone can expect to evolve spiritually, mentally and physically as a balanced person. We provide what is ‘more than just training’. Come with a mindset that everyone is different but yet we are all just the same, and you can be sure that you will discover more about yoga than just Asanas. We all have our struggles, we have our past experiences, we have our opinions and we are trying to learn more about ourselves and, that which surrounds us. Negativity surrounds us as well as positivity and, Rishikul is a great environment to exercise things that you may have wanted to implement for some time i.e. patience, will power, love, open mindedness, etc. Becoming a reformed person with a changed perspective to a positive side, is one of the many soothing outcomes of the course. With years of experience as a yoga school of fine excellence, we thoroughly understand the requirements of a modern yogi. And, so we facilitate our students with all the basic amenities and replenishing food for a wholesome and comfortable stay at our school. We also have 24*7 medical facilities at our schools to ensure health and safety of our students during the rigorous tenure of this program. With an open mind, Rishikul Yogshala provides and facilitates an idyllic environment for incredible personal transformation. 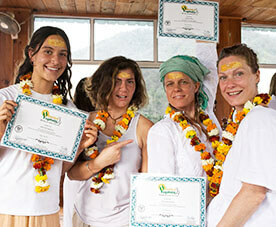 If you are self motivated and passionate about yogic science you will find a welcome home at Rishikul Yogshala. 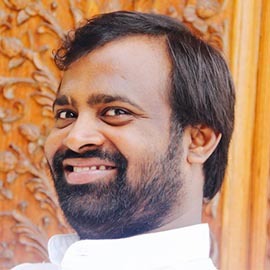 Accommodation With years of experience in providing holistic experience of yoga and spirituality to yogis from all corners of the globe, we strive for complete balance and holistic well-being of our students. To ensure all our students experience a homely stay with us as modern yogis, we provide clean and hygienic accommodation that is equipped with all the modern amenities such as twin beds, attached washrooms, TV, geyser, lights, fans, etc. The students enliven an authentic yogic lifestyle here that is coupled with contemporary facilities for their comfort. 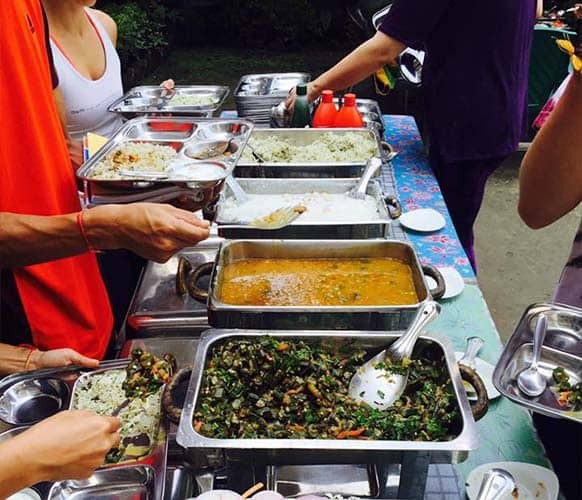 Food We serve wholesome yogic meals to our students, prepared to perfection by our professional chefs who specialize in yogic cuisine. The food offered by us plays a major role in keeping the body doshas, vata, pitta and kapha well balanced and in sync. We serve food to the utter contentment and replenishment of the mind, body and heart of each of our students. The food composition is completely vegetarian. However, if you have particular vegan preferences, then we are more than happy to accommodate your request. All the yoga enthusiasts and yoga lovers are invited for our 200 hour YTTC to enhance their yoga practice and to bring it to a professional level. The most important requirement for our students is to be self-motivated and have a dedicated mindset towards yogic life and ethics. We aim to spread health and peace all over the globe through our students. All the beginner level to intermediate level yoga practitioners aspiring to become yoga teachers or, willing to delve deeper into the lifestyle of Yoga can graciously commence their journey of the science with this program. What To Do After 200 Hour Yoga TTC? The first step after successful completion of 200 Hour YTTC is ‘Practice’ and more intense ‘Self Practice’. Revise the teachings learnt during the program as rigorously as you can so you can build stronger confidence in yourself as a budding yoga teacher and, attain well defined practice too. The next step is to start experiencing yourself as a yoga instructor. You could start teaching a small community, friends or relatives and gain hands-on experience in teaching live classes. 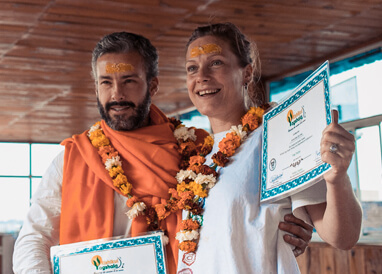 200 Hour YTTC graduates from Rishikul Yogshala are automatically eligible for attaining the rightful status of a Registered Yoga Teacher from Yoga Alliance. Hence, during the next step, you may go ahead and register your certification with Yoga Alliance and gain the status of 200 Hour RYT. Post this, you can prance forward the divine yogic acumen to the entire globe as a 200 Hour RYT (Registered Yoga Teacher). Further, you can also enroll for advanced yoga classes or specialized yoga courses for advancing your practice and knowledge. Alternatively, you may take the next leap forward in your journey of yoga to an advanced level of learning and practice with 300 Hour Yoga Teacher Training Certification. Discover the importance of a yoga-centric life and dwell in its life’s teachings for the complete pacification of the mind, body and soul. Imbibe an optimistic lifestyle no matter what career path you choose to pursue. Gain immense yogic knowledge, as well as develop confidence and self love. Emerge as a confident and refined yoga teacher and, spread an authentic view of yogic sciences across the globe. In addition to personal growth, become a Certified and Registered Yoga Teacher of the most prestigious standards. This is more than just a training, 200 Hour YTTC is an experience waiting to be unfolded as you unfold and revere the layers of your mind, body and spirit.